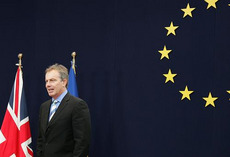 Brussels – A Brussels reporter attempted to place Tony Blair under a citizen’s arrest on Monday (22 March) for his role in the invasion of Iraq, during a visit by the former UK prime minister to the European Parliament for a hearing on the Israeli-Palestinian conflict. Speaking to EUobserver after the event, Mr Cronin said he had been inspired by the attempts to arrest Zimbabwean leader Robert Mugabe by UK human rights activist Peter Tatchell in London in 1999 and in Brussels in 2001. The campaign launched in January by Guardian columnist George Monbiot to repeat the attempt on Mr Blair also featured in his thinking.